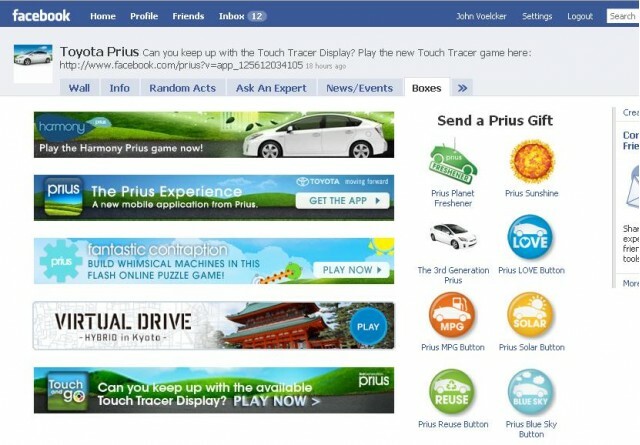 To launch its social media campaign, Toyota asked Canadians: "Are you the # 1 Fan Toyota? ". Thousands of users have streets on the new Facebook page and Toyota Canada's new Twitter feed over the last few months to share their tale in a contest to find the "Fan No. 1 Toyota." This large online conversation from east to west has demonstrated the importance the Canadians their Toyota vehicles. To enter the contest, Canadians can visit the official Facebook page of Toyota Canada and put online to choose from, a video of one minute or five photos and a narrative. About 1,500 eligible participants, six people with extraordinary relationships with Toyota were selected for the final competition. The vote to select the grand prize winner, who will receive a Toyota vehicle of your choice (maximum value of $ 50,000), has already begun. The finalists were selected based on the relevance of their narrative with the theme of the contest (Fan # 1 Toyota), and the number of views their submission. "Each finalist tells a unique and incredible story of his pride and his passion for Toyota," stated Stephen Beatty, Managing Director, Toyota Canada Inc. "We thank all those who participated in the contest by contacting their enthusiasm and their relationship personal with our brand and our products. This competition has demonstrated how the owners of Toyota are eager to share their narratives with us and with each other, and we hope to continue the conversation. " • Rene Boulet (Montreal, QC) - The Toyota Corolla is the preferred car Rene, and he owns four different generations to prove it. • Isaac Elliott-Fisher (Guelph, ON) - Isaac loves his Toyota Land Cruiser so he crosses the North American continent to realize a documentary on the vehicle. • Nathan Hayashi (Calgary, AB) - Nathan did not resist the desire to share his passion for off-road driving his Toyota truck; henceforth it attracts hundreds of followers. • Michel Levesque (New Denmark, NB) - Since its first Corona in 1975, Michel owns more than 40 Toyota all models and all styles. • Jody McMurray (Cochrane, AB) - If this did not vet his Toyota to travel the roads among the highest in Canada, it could not do its job is to heal and save wildlife. • Judy Nadeau (Burlington, ON) - There are almost twenty years, the son of Judy emerged unscathed from a terrible accident of grace road Toyota Tercel he was driving at the time. Since then, Judy has always been faithful to Toyota. To view short videos telling the unique narratives of each finalist, visit the http://toyotatoday.ca/ site. Everyone can vote for their favorite once a day. Voting ends on May 20 The grand prize winner who will receive a Toyota of your choice (maximum value of $ 50,000) will be announced on 1 June 2011. Two secondary prizes (a Panasonic HD camcorder) will also be awarded. In addition, each person who is eligible to vote weekly prize consisting of a $ 100 gas card. The finalists were selected based on the relevance of their narrative with the theme of the contest, and the number of views their submission, as determined by a panel of judges. Participants were encouraged to use their own social media channels to increase the number of views their submissions. Toyota Canada launches challenge "Live Green"
Champlain Bridge: Beam Operation support!